The Division of Nephrology and Hypertension at Cincinnati Children’s is more than a stand-alone laboratory and more than just a center for kidney disease care. Our team of clinician-scientists functions in two worlds: when not caring for children with a wide range of kidney and urinary tract disorders, we conduct groundbreaking research into the root causes of and treatments for these diseases. The result is a robust research environment where basic molecular, cellular and biochemical science translates seamlessly into clinical studies and new therapies. We see the result of our bench work every day at the bedside. This motivates us to dig deeper into the cell biology, genetics and developmental aspects of kidney disease, all of which come together in new techniques to detect and treat these diseases. Learn more about the research we conduct. 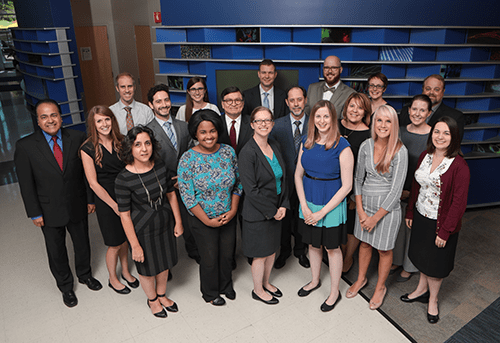 The Pediatric Nephrology Center of Excellence at Cincinnati Children’s Hospital is one of only 3 in the nation supported by the National Institutes of Diabetes & Digestive & Kidney Diseases. The Center of Excellence serves as a national resource for conducting ground-breaking research into pediatric kidney disease. Learn more about the Pediatric Nephrology Center of Excellence. The division’s Clinical Laboratory provides a range of specialized services to help physicians diagnose and treat patients with a variety of kidney and immunologic disorders. Learn more about the tests we can conduct. The division’s Biomarker Laboratory puts personalized medicine within reach of today’s clinicians, with assay services, biomarker evaluation and a range of laboratory and consultation services available. Learn more about the Biomarker Lab. Our nephrology program is ranked No. 2 in the country in the 2018-19 list of Best Children’s Hospitals published by U.S. News & World Report.